Soaring mountains, monasteries, sand dunes, rich fauna and flora define the far-flung Nurba Valley which nestles in the eastern edge of the Karakoram ranges of the Himalayas in northern Nubra Valley. 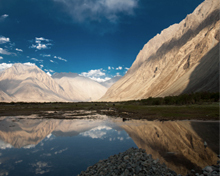 Unlike other parts of the Nubra Valley, the amazing Nurba Valley, which comprises of the Upper Shayok and Nubra river valleys, is a green valley. Deskit in Nubra Valley is 118 km from Leh, the capital of Nubra Valley. In order to reach the valley you can travel by taxi upto Khardung La which is 50 km from Leh. Located at a height of 18,300 feet, Khardung La is renowned as the world’s highest motorable pass. The main highlight of a visit to the Nurba Valley is the presence of the Bactrian camel (shaggy double hump Camel). 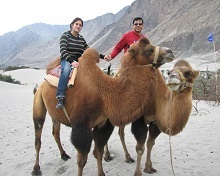 Bactrian camels have two humps and are found exclusively in Nubra Valley when it comes to India. As you descending towards the Nurba Valley, there is every possibility that you will find Himalayan marmots, bharal or blue sheep which live in crags and mountainous area. With a large sandy desert around Hunder, you can find here double humped Bactrian camels which are available for safaris on the sand dunes. 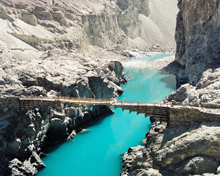 Deskit, where the Nubra River joins the Shyok river, is an important commercial point in the Nurba Valley. The main place of tourist attraction here is Diskit Gompa, or monastery, set atop above town on a craggy hill. It would be a rewarding experience by spending some time visiting the monastery. The road from Diskit to Hunder weaves across sand dunes and craggy hills. 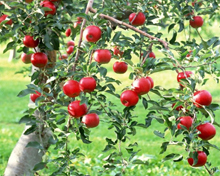 Located some 10km west of Diskit is Hunder which is like an oasis, a small settlement shaded by the green of the orchards, the red of the apples, butterflies and hill birds. The Sumur village in the Nubra village is home to the seventeenth century large monastery of Samstanling Gompa. Nubra Valley also attracts those who are fond of mountain climbing. Saser peak in the Karakoram mountain range is accessible from various points in the Nubra Valley. Manali and Srinagar are well connected by road to Leh, although Manali is a popular starting point. Regular tourist busses and shared jeeps leave from Manali to Leh every day during season time. Cabs and bikes are also available on hire as well. Hotels, guest houses and luxury camps are readily available in different places in Nubra valley. However, homestays are a great way to understand local culture help the native communities develop sustainable tourism and explore wildlife and nature.